Chickichanga fans rejoice! The breakfast burrito–adjacent First Watch favorite is just one of the 75 dishes featured in the inaugural cookbook from the breakfast, brunch, and lunch chain. Started in 1983 by John Sullivan and Ft. Thomas native Ken Pendery, there are more than 290 locations across the country, including 12 right here at home. 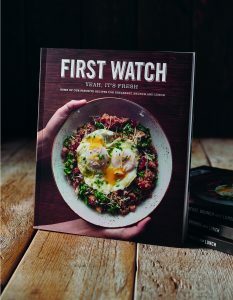 In addition to the First Watch specialty items regulars love (Bacado Omelet, Pumpkin Pancakes, Power Breakfast Quinoa Bowl), Shane Schaibly, vice president of culinary strategy, makes sure readers can handle the First Watch basics, from the house granola, potatoes, and roasted vegetables to eggs any way. Pro tip: Practice your egg flipping with an English muffin to get the motion down. Our favorite recipe? The Million Dollar Bacon, which glazes the breakfast staple with brown sugar, black pepper, cayenne pepper, and maple syrup. Our bloody marys will never be the same. Pick up your copy at any local First Watch location.